A few years ago quite a few articles reported our attention span decreased from 12 seconds in the year 2000 to about 8 seconds. They also reported the attention span of goldfish is 9 seconds. So we have a shorter attention span than fish. BBC news questioned this data. Our attentions spans vary based on the activity we are engaged in making it hard to measure. I have noticed as technology and our society moves faster, my attention span is shorter and I need to work harder on patience. As I watch big fluffy snowflakes drift to earth, in what is spring on the calendar, my patience for winter weather is about at it’s end. Yet nature is one of the greatest teachers of patience. 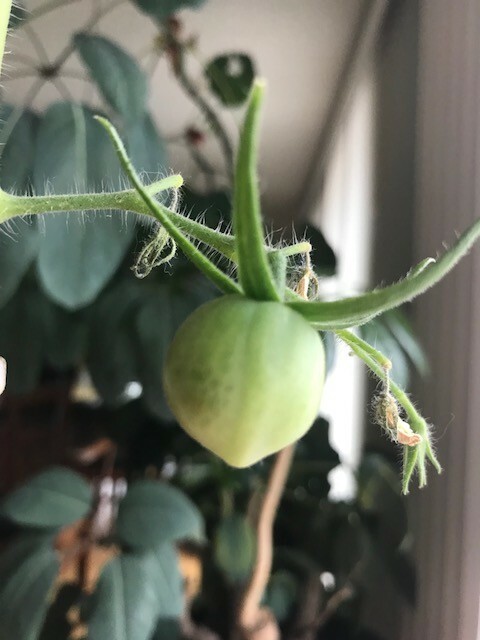 We plant seeds and want tomatoes the next day. We could add grow lights and fertilizer but nature still has her own time table. 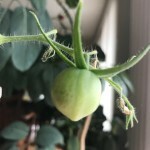 I kept one tomato plant in the house all winter. I almost threw it out many times as every flower it produced withered away. Last week I saw this. So I am working on enjoying time inside while patiently waiting for summer. I can think of many instances in my own life where I wanted something right away and the universe had a much better time table. When I first started teaching aerobics I saw a job traveling all around the country on weekends and certifying others to teach fitness. I was working full time, did not have much money and love to travel and teach. I thought this job was meant for me! I did not get the position. They said they really liked me but I was lacking experience. A few years later when I applied again and got the job I knew the timing was right. I had by then worked at a variety of venues, and taught many fitness formats so I brought way more value to the role. I knew this put me in a much better place to help brand new instructors navigate teaching.